Compact automation products from Mitsubishi Electric help create a revolutionary new thermo-packaging machine - with a 2m2 footprint. 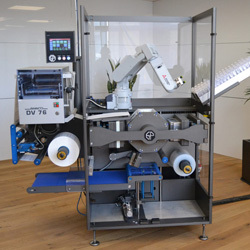 Riverside Medical Packaging created an integrated control solution based on the compact L-Series PLC supplied with servo control and safety modules, HMIs and an articulated arm robot. The new Shawpak branded cleanroom thermoforming packaging machines can now replace a packing line that may stretch out to 20m with a unit that is just 2m2. The new machine offers significant cost advantages to the operator, as the opportunity to increase production or re-purpose existing floor space is considerable. “The high cost of maintaining a clean room production environment increases the benefits and the ROI when using one of our machines” comments David Shaw, CEO at Riverside Medical. The resultant Shawpak models are compact thermoforming sealing machines that can be loaded manually, or for additional speed and efficiency using an integrated Mitsubishi Electric robot. The main innovation is the forming, packing and sealing process which is now carried-out on a drum, rather than a linear conveyor system. The rotary motion of the drum, along with the sealing film is indexed using precision servo control while the product and package manipulation uses suction. The product to be packed is loaded on-top of the drum and ejected into a discharge conveyor underneath. The webs of packaging material, e.g. PET or polyethylene sheets, plus the forming, sealing and cutting stations are positioned around the drum. Thanks to the rotary format Shawpak machines occupy less than 2m2 of floorspace - a 95% reduction in the space occupied by a traditional form fill sealing (FFS) machine. Ivor Rowe, Technical Manager at Riverside Medical confirms “a comparable FFS machine can be anywhere from 7 to 20 metres in length depending on the packaging process requirements, occupying a working space of up to 40 square metres. As a result, a given cleanroom space can fit 6 times more packing machines with a Shawpak design, increasing both productivity and throughput.” The innovative rotary design of Shawpak also increases versatility and flexibility during packaging operations. Different forming drums with cavities of various dimensions are available. These can be easily removed and replaced in order to pack objects of different sizes and shapes on the same machine. In addition, the new concept ensures that every piece of packaging material is used, reducing the amount of waste from cut packaging material experienced by other designs. Mitsubishi Electric has been involved in the development of Shawpak since the initial planning stages, developing the strategy and addressing the project’s challenges. The main one being the extended functionality required versus the restricted space available. LC Automation are one of the largest suppliers of Mitsubishi Electric equipment in Europe. With over 30 years experience of their PLCs, HMIs, a.c. Inverters and Servos, you can be sure that no-one knows more about Mitsubishi Electric than LC Automation. If you would like more information about the Mitsubishi Electric L-Series PLC, or would like to discuss your specific machine application, give LC Automation a call on 01254 685900 and our Sales or Technical Support Engineers will be happy to help.